New Super Mario Bros. Wii(NSMBW) was released on November 15, 2009. It was the first 2D console Mario game to feature simultaneous 4-player action on the screen. The game-play data shown below for NSMBW was reported from November 15, 2009, through November 15, 2010. New Super Mario Bros. Wii has 821,134 Wii owners reporting their play-time, through the Wii's Nintendo Channel. New Super Mario Bros. Wii has 30,885,215 Total Hours of game-play reported, with an average play-time of 37 Hours 37 Minutes per console/person reporting data. The average play-time per session for New Super Mario Bros. Wii is just over 1 Hour 54 Minutes. 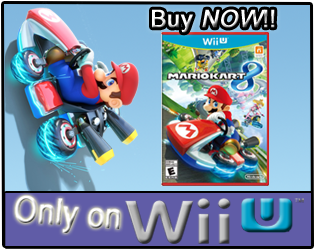 New Super Mario Bros. Wii's review score average is 88.12%, based on 56 reviews on GameRankings.com. 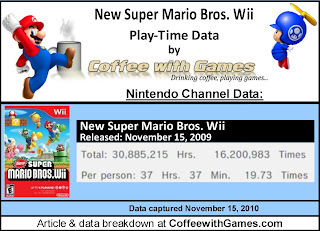 I think the game-play data for New Super Mario Bros. Wii's first year is incredible. The average hours reported "Per person" for NSMBW, are higher than Super Mario Galaxy's and Super Mario Galaxy 2's average hours per person. I think the average hours reported "Per person" show that Wii owners are playing the game through more than once, and the local multi-player is probably a big reason for that. NSMBW is still selling incredibly well, and I think it will do extremely well again this holiday season. When Nintendo announced New Super Mario Bros. Wii at E3 2009, I was interested in the game, but was disappointed when I learned that it wouldn't have online multi-player. I know there were others that wished like myself, that the game had online multi-player; and I remember reading some gamers saying how NSMBW was more a rental, than a purchase, due to the game's short length. Before NSMBW released, I didn't plan on purchasing it. Then, I found myself being a hypocrite one day in December 2009, as I was driving from store to store, looking for a copy of the game. I went by a Best Buy, two Wal-Marts, and 2-3 Game Stops looking for a copy of the game, all with the same results of it not being in-stock. I even wrote an article back in January about it, titled "A Serious Nintendo Wii Problem". While I never did purchase New Super Mario Bros. Wii, I was able to play it, and wrote about the experience Mrs. CoffeewithGames and I had playing it. If you have played New Super Mario Bros. Wii, did you play the game by yourself, or with friends/family; and how many hours do you think you have played? 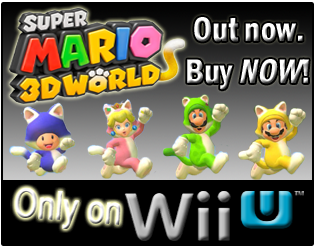 If you haven't played NSMBW yet, do you plan on purchasing/renting it, to give the game a spin? I was able to complete the game, with Mrs. CoffeewithGames, and we even found all the Star coins together. I checked our reported hours on the game, and the total was just over 67 hours. We still don't "own" NSMBW, but it is in our gaming collection right now, on loan/exchange from a friend. I have this game, and would much prefer to play it with others than to play it single player at all, just because of how much the experience improves. I couldn't tell you off hand how much time I've played it. Yea, neither my wife nor I even completed the game by ourselves that I remember, we just played it together. She did go back and play a few worlds by herself, but I don't think she finished it all the way. Thanks for the feedback! Anybody else?